Hot, crowed and energetic, Taipei has grown from a swampy farming settlement into a modern metropolis in a blink. With a richness and depth of character seldom matched elsewhere, it offers travellers a unique sense of both the modern and the traditional. Taipei is packed with incredible attractions, excellent restaurants and magnificent hotels. The city also gleams with glitzy shopping malls and wonderful museums. Temples, spas and peaceful gardens offer a nice change of pace. 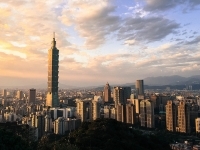 Whether visitors are shooting through on business, or holidaying, Taipei will not disappoint.